A local ecumenical partnership of Methodist and United Reformed (Congregational, Presbyterian, Churches of Christ) Churches. Main service Sundays 11.00 a.m. with Junior Church. Holy Communion usually first Sunday of the month, Family service 3rd Sunday . Weekday groups. Jesus Fellowship - evangelical and charismatic church with doors open for everyone. Most of the events taking place in a community house in North Acton on Wednesdays, Thursdays, Saturdays and Sundays. Email us for details on regular BBQs and outreach. SUNDAY MASS: 10.30am. Daily mass times vary - full details on our website. Children's groups. Social groups. Outings. This friendly and inclusive Anglican Church looks forward to welcoming you soon. Open to visitors. Introduction meetings held each month please call for details. We also have a bookshop & Butsumas (prayer rooms ) for the chanting of Nam-Myoho-Renge-Kyo. Group discussion meetings held at members’ homes again call for details. This mosque was founded by Haji Bashir from Pakistan and Aizul Haque from India. It was established in 1988. Services Sun, M (Sat 7pm), 9, 10.30, 12, 6pm; HH 7pm. Hds, M 7, 10, 8pm. Wkds, M 7, 10; (Wed and Fri 10, 7pm; Sat 10, 12) Conf: Sat 10.30, 12.30, 6 to 7pm. Services: Sundays- 10.00am. Wednesdays -7.00pm. A church to belong, grow and discover God's purpose for your life. Enter into your inheritance today as you become a part of God's vision. Opened in 1961, St Aiden's houses an extraordinary collection of contemporary art in glass, perspex, ceramic, wood and paintings, especially Graham Sutherland's great crucifixion. Located at the junction of Du Cane Road and Old Oak Common Lane, 2 minutes from East Acton tube station. Modern Catholic worship. School parties of up to 60 pupils are welcome, and the church will provide speakers to both Secondary and Primary Schools. Anglican Church. Connected with Twyford School, has services for the Christian Japanese community and has links with Churches in Malawi and Arlington, Virginia. Baptist - a cell church. This means that the focus of the church is on small groups or 'cells' that meet weekly, usually in someone's house. 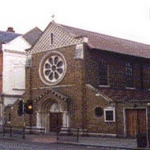 An ecumenical, charismatic, covenant, Christian community based in West London. If you wish to attend a meeting, send us an email. Shin Buddhist house. Branch of the Shogyogi temple.